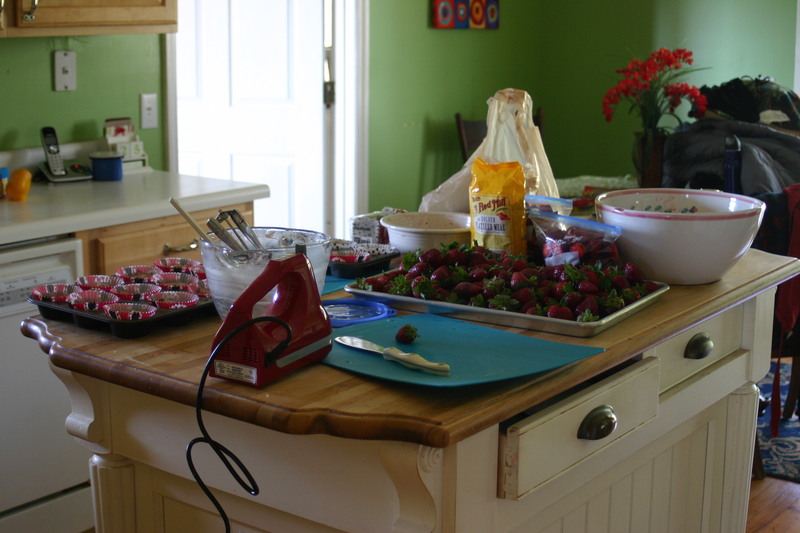 ***This post was written last year on my old blog, but since it’s strawberry time once again (Hallelujah!) I thought I’d dredge it out of the archive. Once upon a time, my husband, in a wonderful display of romance, bought me 5 flats of Plant City strawberries. I grew up not too awfully far from Plant City, Florida, and more than once, my mom and I drove over to eat our way through the strawberry fields whilst picking some for later. So it was with much joy in our little town near the Smoky Mountains that a few years ago, a man would bring a van full of Plant City strawberries, selling flats of them on the side of the road. My husband, who often has to listen to some of the many things I miss about living in Florida (shuttle launches and landings -sadly, no longer – the beach, fresh seafood at the grocery store, the beach, Sea World, picking strawberries in the “winter,” the beach, wearing shorts year-round, fresh-squeezed orange juice on Christmas morning, Disney, and the beach to name a few) has done his absolute best to satisfy some of those longings when he can. For instance, every year for Christmas he buys me a bag of oranges. You may think I’m crazy, but I think it’s one of the most romantic things he’s ever done for me. Especially that first year he brought them to me. Having grown up mainly in Florida, I equate the Christmas breakfast feast with fresh-squeezed orange juice. Oranges are always in season around Christmas time. And if we didn’t have an orange tree, somebody we knew did… until we moved to the mountains of Tennessee. Practically despondent that first Christmas here, my husband surprised me with a bag of oranges. Say what you will, but I remember that gift and have absolutely no recollection of any others I may have received that year…. That’s what I call real romance. So a few years ago, when my husband saw a van parked on the side of the road advertising Plant City strawberries, he just knew he had to buy some. And not just some, a lot of them. 5 flats of them. If you don’t know how many 5 flats are, you know those little green baskets of strawberries you can buy at the grocery? There are 12 of those baskets in a flat. That’s a LOT of strawberries. Even more so, when you don’t have enough refrigerator/freezer space to store them before they go bad. Especially when you didn’t have your day planned around 5 flats of strawberries. He thought he was being romantic – and he was. He just didn’t know how much work 5 flats of strawberries was going to be. He thought he would make me happy – and he did. Because I spent 3 days in a strawberry coma. Besides freezing a LOT of them, and eating a LOT of them (who needs Benefiber when you’re eating your way through 5 flats of strawberries??? ), I also made 12 pint jars and 6 qts. of strawberry jam, strawberry cake, strawberry mousse, strawberry shortcake, strawberry scones, strawberry ice cream, and strawberry smoothies out the wazoo (literally). Alas, the strawberry man went missing a couple years ago. But this year, he was back. My husband called to see how many flats I wanted. He helped me clean them this time. He helped me cut the tops off this time. He helped me cook this time. He helped me freeze them this time. He helped me clean all the red juice off the floor this time. And he apologized for ever bringing me 5 flats of strawberries once upon a time. I’m pretty sure he learned his lesson. Still, I needed to find some creative things to do with my two flats. I did freeze some, but I also wanted something beyond the normal strawberry fare. And my husband is trying to eat much more healthy these days, so I needed to find food that didn’t put him over the edge. 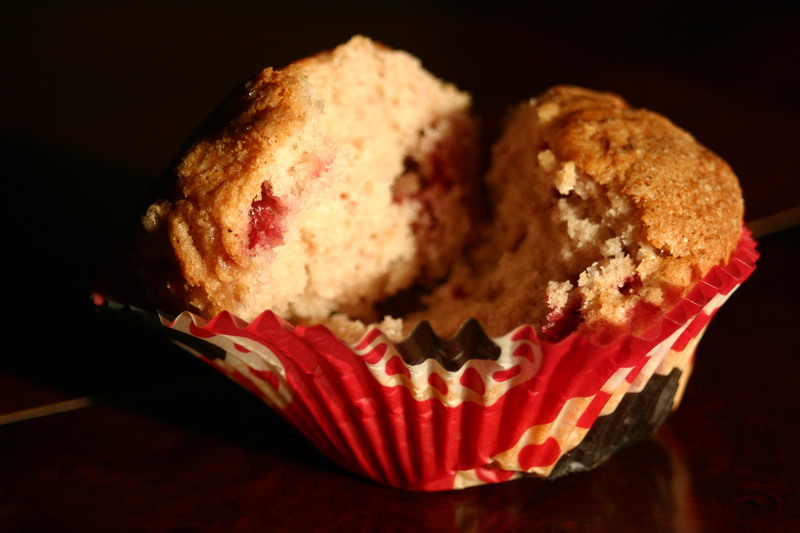 So here are two things that I made, and the recipes to go along…. My husband’s favorite fruit flavor of ice cream is strawberry. Go figure, right?!? But all that cream might be a little much for someone aiming to lose some weight. 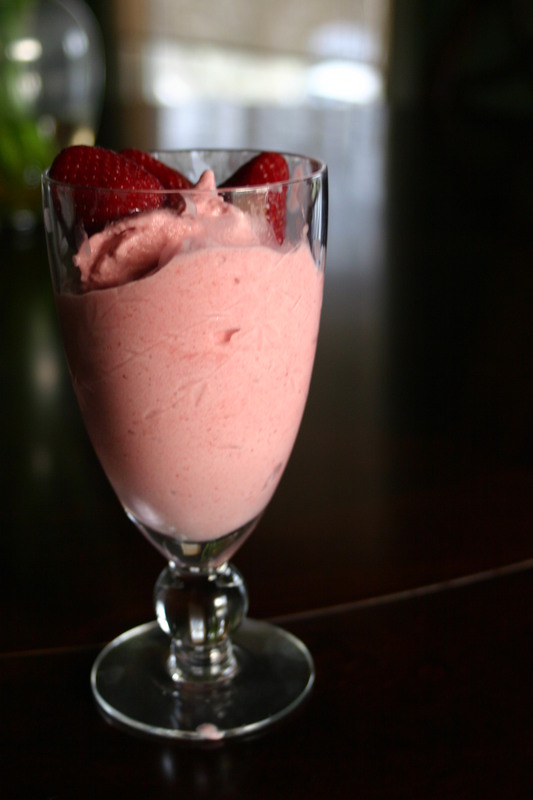 I found a recipe instead for Strawberry Sherbet. Even though there’s still sugar in it, and the recipe called for cream, I adapted the Cooks Illustrated recipe using milk rather than the cream. It tastes pretty darn wonderful still. 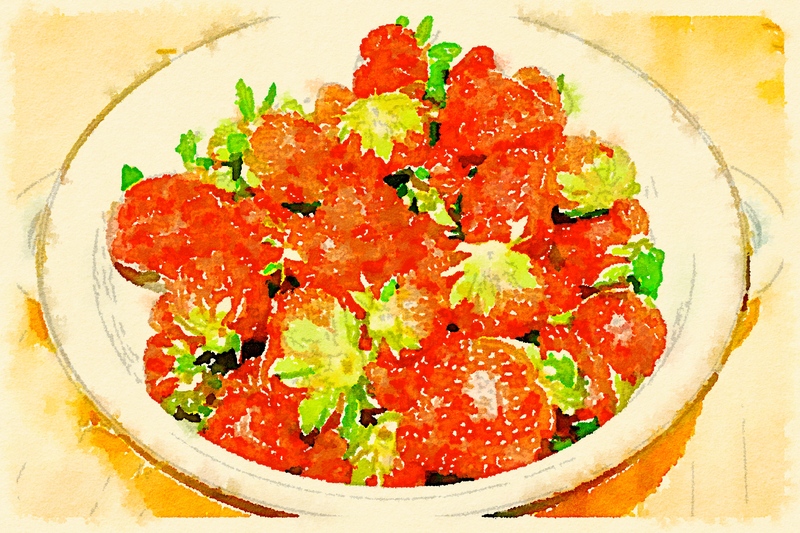 Place the berries, sugar, water, and salt in a saucepan. Bring to a soft boil over medium-high heat. Cook just until the blackberries start to pop and release their juice. Strain the puree through a fine mesh sieve into a clean bowl. Press and scrape the solids along the bottom of the sieve to get as much puree as possible; leaving only seeds behind. Add the lemon juice and vodka. Cover with plastic wrap and chill in the refrigerator about 2 hours. In a separate bowl, mix together the milk plus the heavy cream. Slowly pour into the fruit puree. 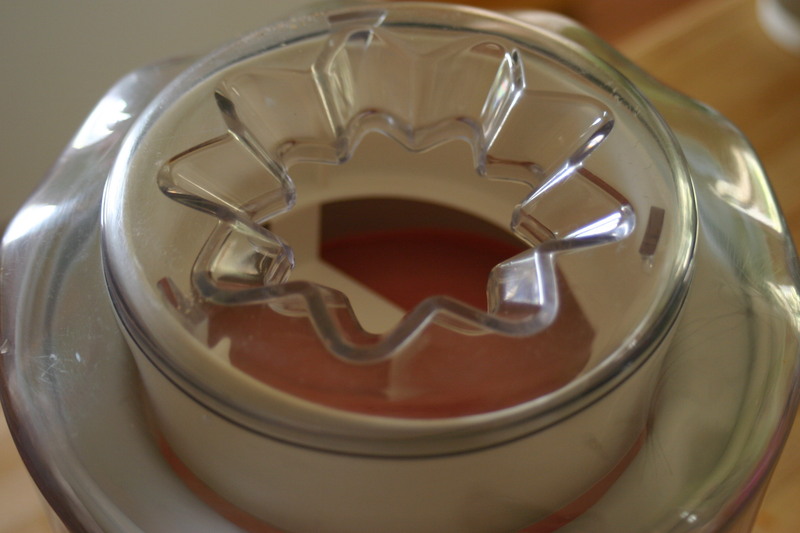 Turn on your ice cream maker and while it’s running, pour the cream/fruit mixture through the feed hole. Churn according to manufacturer directions. Transfer finished sherbet to a plastic bowl with a tight-fitting lid. Freeze for a few hours until firm before serving. Makes about 1 quart. *Vodka helps keep the sherbet softer and easier to scoop. Makes 1 1/2 dozen muffins. And yet one more recipe! 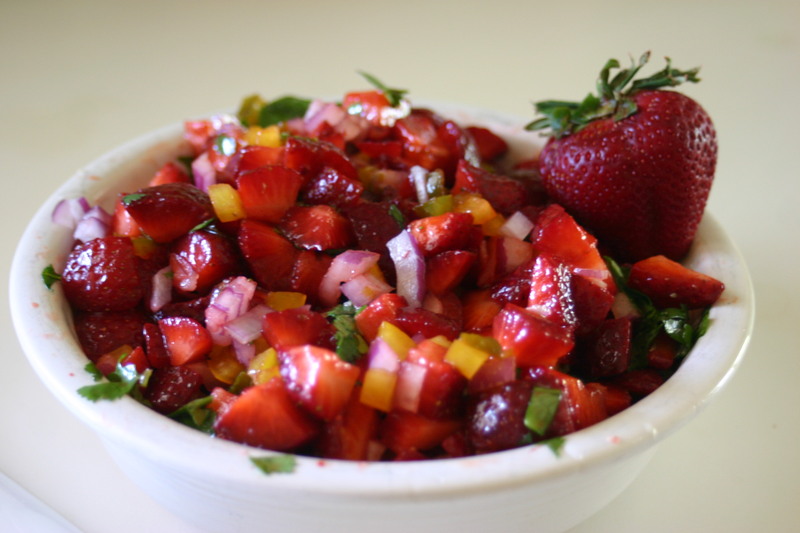 Strawberry salsa is always good on fish tacos, mixed with some grilled chicken and greens, makes an excellent salad; the possibilities are endless. One of my favorite restaurant meals is the grilled tilapia with warm mango salsa from Bonefish Grill. I love this meal in an abnormal way. I crave it. In fact, after my first marathon, my husband took me to Bonefish, and it was all I could do to wait for it to arrive at the table – my appetite was waaaayy off the charts! It’s full of protein, super tasty, and not a heavy meal at all. Perfect for having just run 26 miles. Or, for that matter, perfect for a day sitting around watching Sandra Dee movies too. I’ve found the recipe for the Bonefish Grill warm mango salsa online, so I merely switched strawberries for the mango. I imagine it would be delicious on chicken or fish, but this night I used it over a jerk pork tenderloin. It was pretty wonderful. The recipe at Bonefish doesn’t use fresh jalapenos, but I like them, so I substituted those for the red chili flakes. It also provides a little extra color. This salsa can be served either warm or cold – it was great lightly warmed in the microwave over the pork loin, but it’s fabulous cold over fish tacos! Chop the first 7 ingredients and mix together. Mix olive oil, lime zest, and lime juice together; pour over salsa. Add salt and pepper to taste, and then mix thoroughly. Let the salsa sit in the refrigerator for at least 2 hours for the flavors to meld. Serve with chips, on tacos, over fish or poultry. *I am a big fan of Jane’s Krazy Mixed-Up Salt and use it for most things calling for salt and pepper. It not only has salt and pepper in it, but herbs and spices too. …this post is about a fruit-filled trifle that has become one of the tastes of summer for me and my family. You know, like watermelon says summer. Corn-on-the-cob says summer. Hamburgers on the grill say summer. Like that.